Giant rabbits can make wonderful pets. Their larger than life characters and enormous stature make them delightful to own. However, they come with their own set of special requirements and potential problems, so it is important to ensure you can meet these needs before making the commitment. A giant rabbit should not be confused with an overweight rabbit, whose weight and size is larger than it should be! A giant rabbit is supposed to be just that…a giant and can weigh anywhere from 5kg – 10kg or more. This is larger than many dogs! As you would expect, the sheer size that these rabbits can reach means they need much larger accommodation than smaller rabbits. All rabbits should be kept in neutered pairs, or larger groups, and giant rabbits are no different. Pet shop hutches are rarely, if ever, big enough to accommodate two giant rabbits, or even a giant rabbit and a smaller breed. Giant rabbits may be over 4ft when stretched out or when standing on their hind legs and as a basic minimum they should be able to take at least 3 consecutive hops in any direction at a time, potentially 12ft in total. Therefore it is best to accommodate giant rabbits in a large shed, aviary or house rabbit arrangement. Sheds can easily be converted and an outdoor run attached, and aviaries come ready made with an indoor and outdoor enclosure. This allows the rabbits plenty of room. Tunnels, toys and shelves to hop onto can all be added into such an environment to provide entertainment. All of this comes at a price and as a basic minimum you can expect to pay upwards of £300 for accommodation suitable for giant rabbits. This needs to be considered carefully before acquiring giant rabbits. 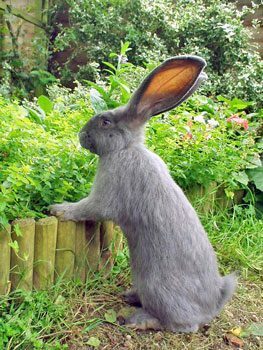 As with all rabbits, giants need daily exercise, preferably in a safe and secure garden, free from potential predators, escape routes and poisonous plants. Are you going to be able to provide this or a large (over 20ft square) of space, in which they can exercise, play, graze and forage in? The majority of rabbits do not like being handled and giant breeds are no different. Their massive size makes them awkward and often difficult to handle safely and competently. They can inflict nasty scratches and powerful kicks in an attempt to escape from incorrect handling. This can not only injure the owner, but also cause fatal spinal/hind limb fractures to the rabbit. Therefore they should only be handled when necessary (i.e. health checking, checking/cleaning back end, claw clipping etc.) and should be handled with the owner sitting on the ground. The spine must be supported at all times. Contrary to popular belief, giant rabbits do not require much in the way of concentrated food. Young, growing rabbits all require extra concentrated food (preferably extruded nuggets to prevent selective feeding), but adult giant rabbits only require a small handful or just over an eggcup of pellets each per day. Ad lib amounts of hay, a large mound of fresh greens, and fresh, clean water is also required each day, as with all rabbits. Giant rabbits do not need any form of mineral or vitamin supplements added to their diet, if they are fed as above, unless specifically prescribed by your vet. Due to their vast size, giant rabbits are very prone to Pododermatitis (sore hocks) due to the pressure applied to the hock. These can become advanced if not caught and treated early, so it is important that thick, soft bedding is used and the hock/feet areas checked daily. Arthritis and spinal spondylosis seem to be very common in giant rabbits as they age. You may notice the rabbit slowing down, shuffling on their hind limbs, and becoming urine and faecal contaminated. The conditions can often be managed medically with medication, so it is important to take your rabbit to see your vet as soon as possible. Flystrike can affect any breed of rabbit, but many giant rabbits, especially does, may have a pronounced dewlap which inhibits grooming around the back end. It is important to try and keep giant rabbits on the slim side to prevent this occurring, and checking their back end at least twice daily, using preventative measures (fly netting, Rearguard etc This product can be used if your rabbit is at risk of flystrike, as recommended by your vet. ), and cleaning when necessary is an absolute must. Heart problems are also seen in giant rabbits. Cardiomyopathy is deemed to be much more common in large and giant breeds of rabbit, and can be the cause of sudden death in giant rabbit breeds. Dilated cardiomyopathy, where the heart becomes enlarged and weakened, meaning it cannot pump blood effectively around the body, is the most commonly seen heart problem in giant rabbits. If caught early medical management can be attempted. On a par with giant dogs, the giant rabbit breeds do seem to have a shorter expected lifespan than their smaller rabbit counterparts. On average you can expect a giant rabbit to live 4 – 6 years, although some may exceed this.